Japan­ese knotweed was first intro­duced to North Amer­ica in the late 19th cen­tury for orna­men­tal use, which actu­ally is under­stand­able. Its hol­low red tinged stems have dis­tinct raised joints (nodes) that remind me a lit­tle of bam­boo although it is not at all related. In fact, other com­mon names for the plant are Amer­i­can bam­boo and Mex­i­can bamboo. Japan­ese knotweed spreads quickly and forms dense thick­ets that exclude native veg­e­ta­tion. It poses a sig­nif­i­cant threat to ripar­ian areas. At the end of August the plant pro­duces clus­ters of cream-colored flow­ers. The plant is quite attrac­tive — at least on the sur­face. But oh once it’s estab­lished, kind of like the end­less reruns of I Love Lucy only not so funny, Japan­ese knotweed just will not go away. The prob­lem is Japan­ese knotweed doesn’t have any nat­ural ene­mies in the North San­tiam Canyon, so once estab­lished, knotweed stands are are almost impos­si­ble to get rid of. On top of that it spreads quickly, well quickly isn’t the word — too tame. I mean, the first time I saw this plant, I leaned over to get a closer look. Before I knew it the dang thing poked me in the eye, it grew so fast. 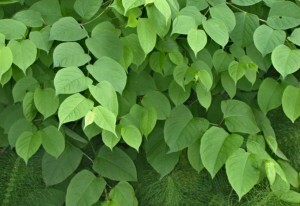 You need to be care­ful with Japan­ese knotweed. It thrives when­ever it gets a toe­hold on sunny, moist areas — like creek and river banks. Worst of all, it forms a dense under­ground net­work of roots that choke out our native vegetation. Did I men­tion it ‘s almost impos­si­ble to get rid of Japan­ese knotweed once it’s estab­lished? To erad­i­cate the plant you’ll need to kill the roots. Not most of the roots, not stress the root, you need to kill every last frag­ment as dead as a doornail. Don’t try dig­ging. All it takes is a piece of rhi­zome (root) the size of your baby fin­ger­nail and it’ll be back. And it isn’t uncom­mon for the roots to spread up to 15 feet, maybe more in each direc­tion and as deep as 9 feet. So really, don’t try dig­ging it out. It isn’t likely to work. Hit­ting the plant hard with her­bi­cides doesn’t really work either. Spray­ing kills the tops sure enough, but before the her­bi­cide acts on the deeper roots, Japan­ese knotweed goes dor­mant. And stays dor­mant for a cou­ple of sea­sons. Then just as soon as you think you’ve got it licked.…. it’s back. Grad­ual poi­son­ing of Japan­ese knotweed gives bet­ter long-term results than fre­quent, strong chem­i­cal appli­ca­tions. The above-ground por­tions of the plant need to be con­trolled with her­bi­cide again and again, year after year to grad­u­ally weaken and even­tu­ally erad­i­cate the patch.